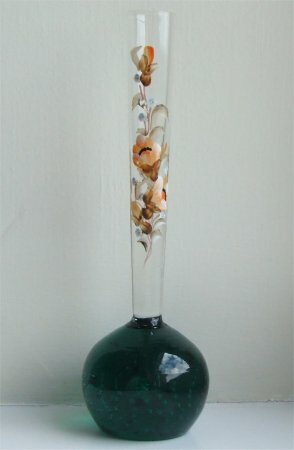 This green vase is 159mm (approximately 6 inches) tall. 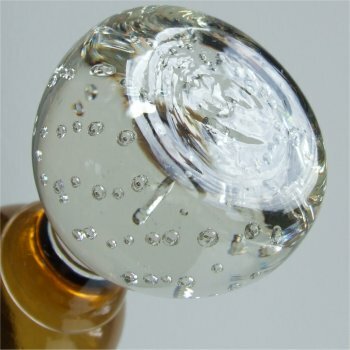 The stem is clear and has a narrow flare of 18mm (approximately 7 10ths of an inch. 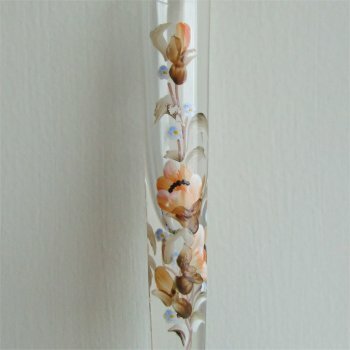 There are flowers on the front of the stem which are hand painted in enamel in mainly peach and brown colours, with a few small forget-me-nots. The bottom of the base has a slight depression in the middle with crease marks. (see images below). My best guess on this one would be possibly Bohemian, although the bottom of the base is finished differently to others I have. 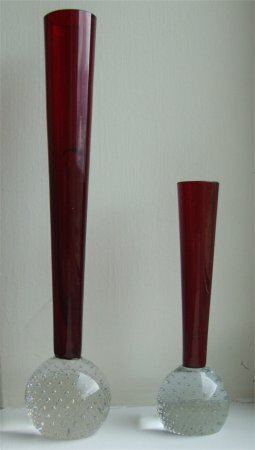 The tall vase is approximately 240mm (9 & 4/10ths inches) tall. 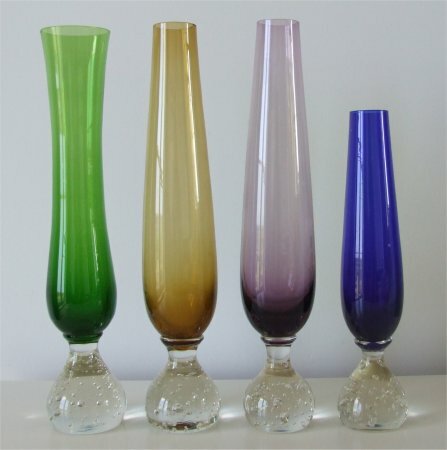 The short vase is 145mm (approximately 5 & 7/10ths inches) tall. The red stems are unusually thick and have a medium flare. The tall one measures approximately 30mm (1 & 1/10th of an inch across). The short one measures approximately 25mm ( 1 inch). The top of the stem has been ground flat and polished. 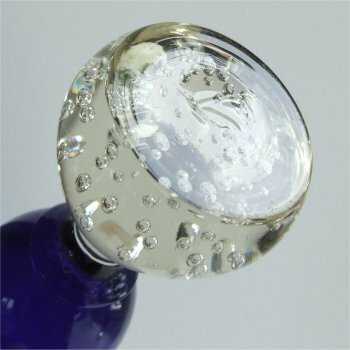 The clear bases are round and have tiny very well controlled bubbles. 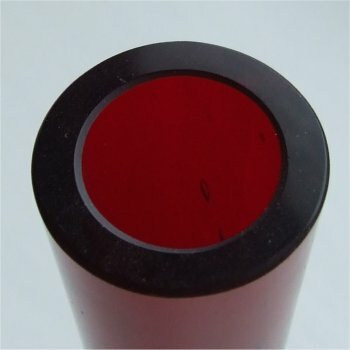 The bottom of the bases are ground flat and polished. (see images below). 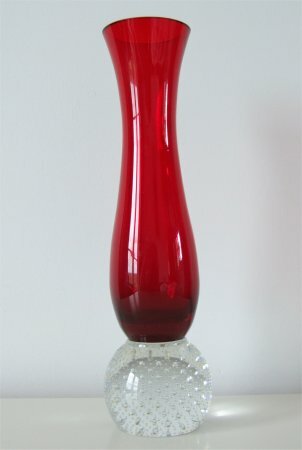 This vase is approximately 202mm (8 inches) tall. 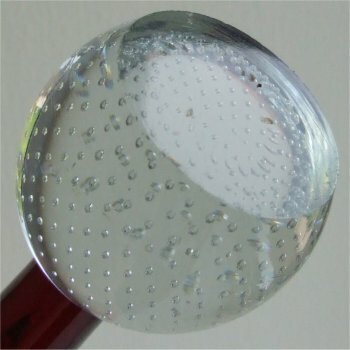 The clear base is round and has tiny very well controlled bubbles. 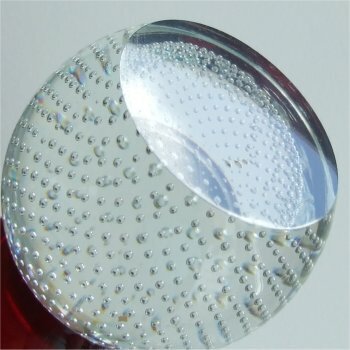 The bottom of the base is completely flat and polished. The stem is red, bulbous at the bottom, waisted and flares out at the top. It measures approximately 45mm (1 & 3/4 inches across). The top of the stem has been 'ground' flat and polished. The base looks identical the the red vases above, and I feel they may be related. 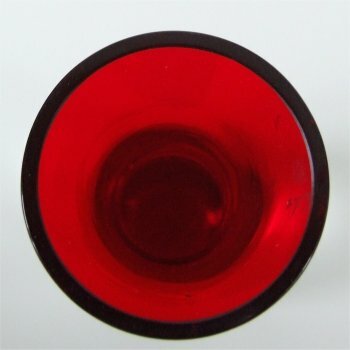 However because of the difference in thickness of the red glass I cannot compare the two. (see images below). 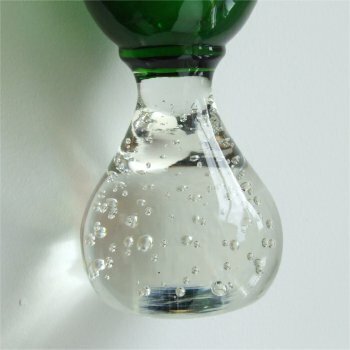 These vases have barrel shaped bases with small to medium sized bubbles which mainly come up vertically from the base. 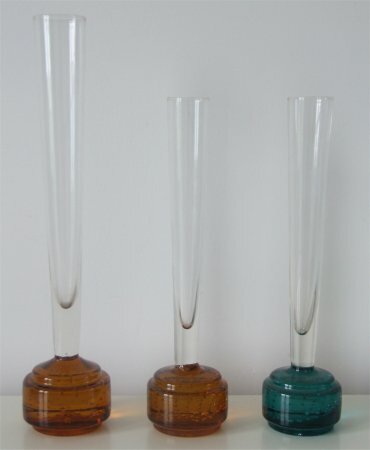 The tall amber one is approximately 255mm (10 inches) high. the shorter blue and amber ones are approximately 208mm (8 1/10th) high. 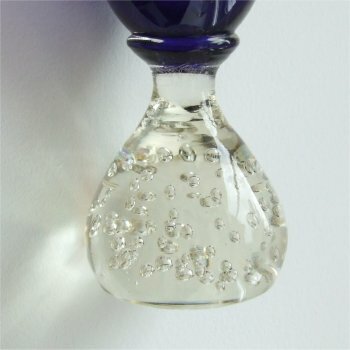 The stems are clear and have a medium flare The tall one is approximately30mm ( 1 2/10ths) across, and the shorter ones approximately 25mm (1 inch) across. The bottom of the bases are flat but have a creased finished. 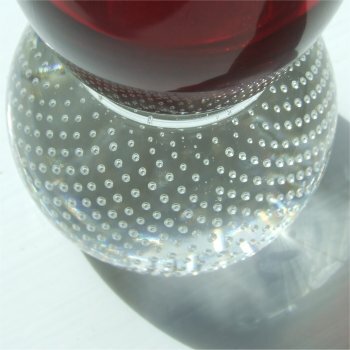 These vases have clear, pear shaped bases with a distinctive ring where the base joins the stem. 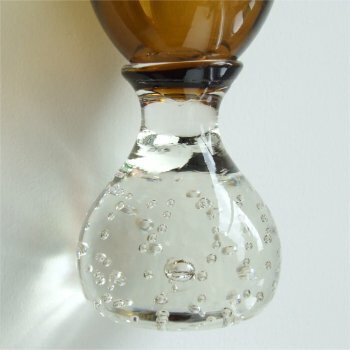 They have small to medium sized bubbles and a mixture of controlled and random. The bottom of the bases of the blue and amber are more or less flat but have some creasing. 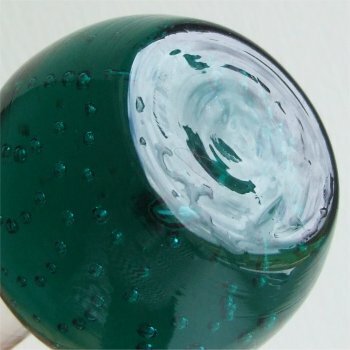 The green and amethyst are smoother but have a slight dimple in the middle. (see images below). The tall ones are approximately 255mm (10 inches) tall, the shorter blue one is approximately 180mm (7 8/10ths of an inch) tall. 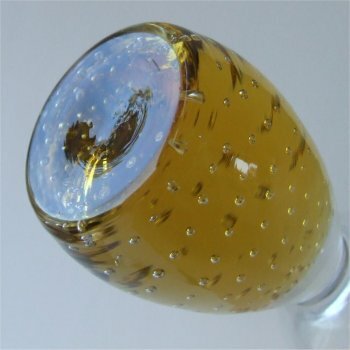 The stems of the amber, blue and amethyst are bulbous at the bottom and taper in towards the top. 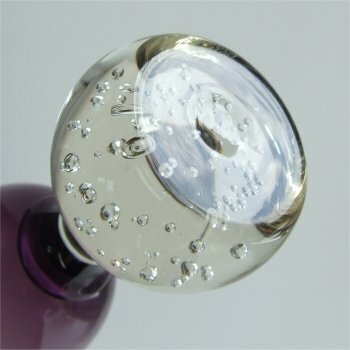 The amber and amethyst measure approximately 25mm (1 inch) across the top. The blue is approximately 24mm (9/10ths") across the top. The stem of the green is bulbous at the bottom, narrows towards the top and flares out again at the top. It measures approximately 43mm (1 7/10ths inches) across the top. 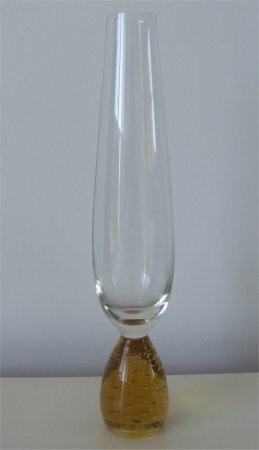 This vase is approximately 208mm (8 2/10ths inches) tall. 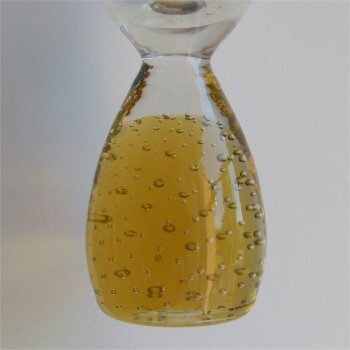 The base is unusually tall and slim and has a light amber core encase in clear. 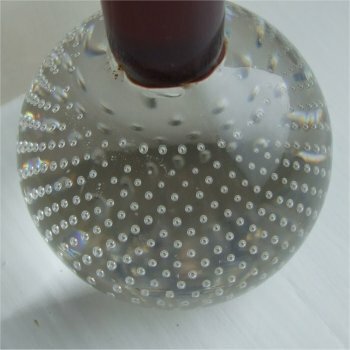 The bubbles are small and well controlled and form an arch on either "side" of the base. 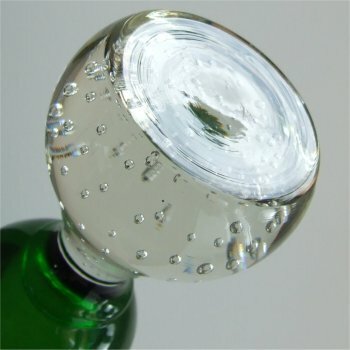 The bottom of the base is smooth with a "dimple" in the middle. 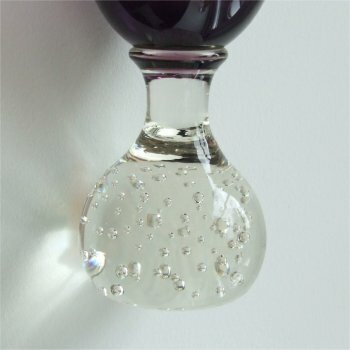 The stem is clear and has a bulbous shape, the top of the stem is approximately 23mm (9/10ths of an inch). (see images below). 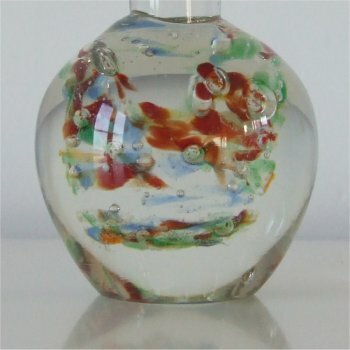 The small well controlled bubbles and the typical dimpled base lead me to believe this is most likely a Czech vase. 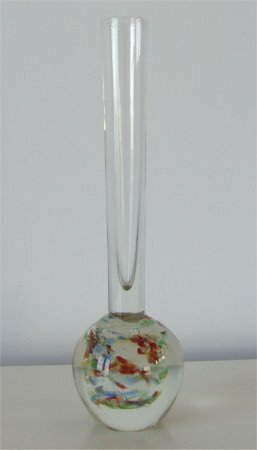 This vase is approximately 156mm (6 & 1/4 inches) tall. 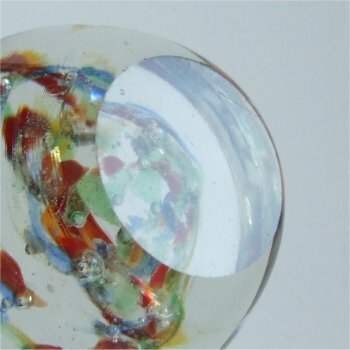 The base is heart shaped and has a multicoloured core (red, blue, green and orange) encase in clear. 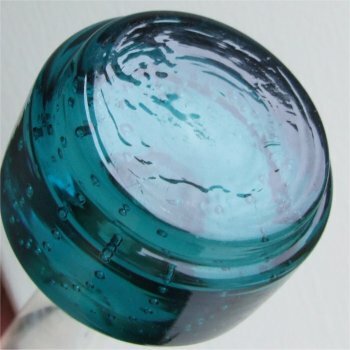 There are different sized, completely random bubbles mixed in with the colour. The bottom of the base has been 'ground' flat and polished. 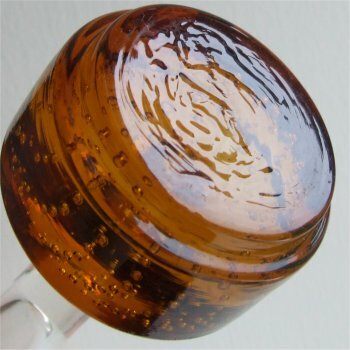 The stem is clear with a narrow flare, the top of the stem being approximately 17mm (11/16ths of an inch). (see images below).